The Aquios® AQF220L is our stronger version of the AQFS220. Our "L" model still uses the same salt free water softening technology to prevent hard water scale but utilizes a stronger, 1 micron coconut carbon filtration medium. The stronger filtration will remove more chlorine odor and taste for a longer period, reduce chloramines, VOCs, pesticides, cysts, rust, and other dirt and sediment larger than 1 micron. This is the most powerful model in our 220 Series. The Aquios® salt free water softener and filtration system is a full house water conditioning and filtration system that utilizes commercial strength technology and performance in a sleek, compact design. It also does not replace the healthy minerals your body needs with salt or potassium. This system will ensure that sediment, chlorine and other undesirable materials are removed from your water and that calcium, magnesium and other by products found in hard water do not build up on your fixtures and pipes, and provide clean, pure and healthy water to you and your family. Unlike salt-based systems, the minerals that make water “hard” are not removed. Instead, Aquios® utilizes a commercial, natural technology that ensures that these minerals do not accumulate or build up on faucets, water heaters, shower heads, internal pipes or any other device that utilizes your existing water source. 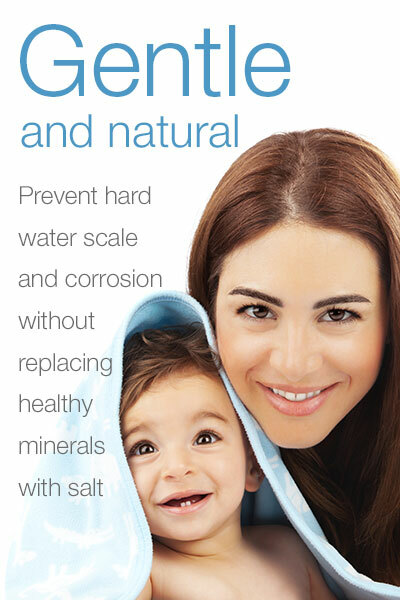 This natural technology is a polyphosphate additive known as Siliphos® which inhibits scale deposits and, over time will slowly reduce scale buildup on your pipes and appliances. The result...most scale-causing minerals pass through the systems instead of forming deposits on pipes, fixtures and appliances such as water heaters. You will notice a difference in “water feel”, but not one that is “slippery” as is commonly found with salt water softeners. The Aquios® Water Softener and Filter System includes your first cartridge and should last an average family approximately three (3) to six (6) months before it requires replacement.